Kamalanathan is a relative of Samy Vellu whom he can control, so Samy makes a pact with UMNO to play it for the public to ensure his hold on the party and the supporters are not affected. In this way, he would look good for the public as he can point out to the Indian voters that he had no choice but to abide by UMNO’s decision. The hate factor, at least amongst the Malaysian Indians, at the moment is Samy Vellu. BN needed to engineer a way out to persuade those Indian voters there to vote for BN. Samy played the role assisted by UMNO on how to hoodwink the public and get the result they want without bringing Samy into the picture. This is a typical good cop, bad cop scenario. Read here how Kamalanathan had been lobbied by Rocky Bru,UMNO’s media spinner, in the Malay Mail. The Indians in Hulu Selangor are in this state bcos of 50 years of neglect by MIC/UMNO. He is just trying to manage the symptoms as a result of the negligence all these years. Give him personal credit for that but putting BN back in power is a nightmare for the Indians that they can’t wake up from. Najib admitted BN made many mistakes stole their assets but he promised to make up for past mistakes by giving the best to the people of Selangor if they present mandate to BN in the upcoming general election. Teoh Beng Hock’s life was not worth RM2,000, because he had nothing to do with the money. Which, in the first place, was not even misappropriated. His life was worth zero sen.
You must be very happy, Najib. That’s the way to treat those ‘pendatangs’ who refuse to return to China or India, no?For the family of Teoh, let’s pray together and do our utmost best to effect a change from this hideous, racist, unjust and swindling government, and I sincerely and very strongly believe that all our good fellow Malaysians will never let this matter rest until it is properly and rightfully put to rest.We shall never rest; we shall never close this chapter unless the truth is unearthed. Teoh was not a common criminal. If there is no closure to his death, racism, bullying and persecution will perpetuate. Yes, never rest.“Maybe we made some mistakes in the last election, but we will always be the best in future,” he said. In terms of scale, the Talam Corporation Bhd debt settlement pales in comparison with the Port Klang Free Zone (PKFZ) and Scorpene submarine cases. The mainstream newspapers have been going at great guns with the so-called TalamCorp scandal. Understandbly because they are partial to the Barisan Nasional (BN) government. As for the alternative media, the reverse is true as some are partial to BN’s political foes, the Pakatan Rakyat (PR). Yet, there’s a marked difference between PR and BN which can be seen by how each one has serious allegations of corruption and mismanagement and their respective reaction to the claims. In the TalamCorp case, PR leaders are prepared to have a White Paper on the matter although it is puzzling why there has not been one since the case came up in 2010. And PR MPs such as Tony Pua and Dr Dzulkefly Ahmad and even Tan Sri Khalid Ibrahim are all willing to lift the veil of corporate secrecy and explain the numbers to the public. After all, it involves public institutions and funds from the time the deal was struck when Selangor was under BN rule. Transparency is key to all this. But how about the the other side. The PKFZ case took years after the Auditor-General and several journalists raised alarm bells. Even today. the federal government is paying money which should not be paid until the entire case is settled. What do you say, Mr Prime Minister, sir. Or Dr Chua Soi Lek or Chua Tee Yong? What do you say, sirs?Or the Scorpene allegations and claims of the sale of state secrets. All we have is bare denial and some mumbo-jumbo from Datuk Seri Ahmad Zahid Hamidi that nothing happened. Well, ask the French if nothing happened. They have a full-scale inquiry going on about that and we do the Gallic shrug, sir? 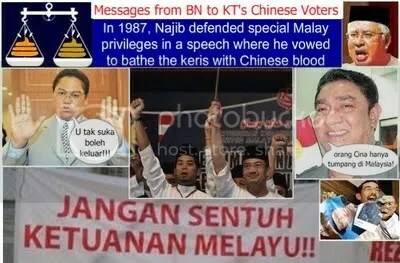 Really?Absolute silence seems to be the norm from the BN side. Way back during the Carrian and BMf saga, silence was also the standard operating procedure for BN.It doesn’t take a genius to figure out how each side views such allegations or are prepared to come clean, admit faults and repair the damage. Is it too much to admit faults, sirs?In the final analysis it seems is that: one coalition is quite prepared to be put under scrutiny and another coalition has something to hide. You know, sirs, that would be a great consideration when I do vote in the next general election. can’t speak for all Malaysians but I want an honest government, not one that runs down their foes but have a lot of dirt under the carpet. In terms of scale, the Talam Corporation Bhd debt settlement pales in comparison with the Port Klang Free Zone (PKFZ) and Scorpene submarine cases.The mainstream newspapers have been going at great guns with the so-called TalamCorp scandal. Understandbly because they are partial to the Barisan Nasional (BN) government. As for the alternative media, the reverse is true as some are partial to BN’s political foes, the Pakatan Rakyat (PR).